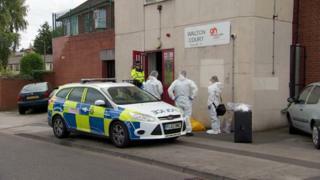 A suspect has appeared in court accused of murdering a man at a flat in Nottingham. John Inger, 58, was pronounced dead in Walton Court, Carlton, in the early hours of Saturday. Steven Wooley, 31, of Manvers Court, Nottingham, was remanded in custody by city magistrates. He is due to appear at Nottingham Crown Court on Wednesday. A second man, 33, who was also arrested in connection with the incident, has been released without charge. Officers said there was no risk of harm to the wider community and are appealing for witnesses.